Available as a simple-to-operate trailer- or truck-mounted unit, the RD-1200XT can be adjusted for 8-ft to 12-ft (2.4m to 3.7m) drying widths. Traditional attempts at drying pavement for construction or maintenance work have typically involved the use of jet engine dryers, infrared heat, or portable blowers, combined with brooms and manual squeegees. Each of these methods has its own limitations and safety concerns, including the use of jet fuel, noise, melting pavement, danger from thrown rocks or other objects, and slow results. Because of this, traffic is often fully restricted from traveling on roads or runways where drying work is taking place. 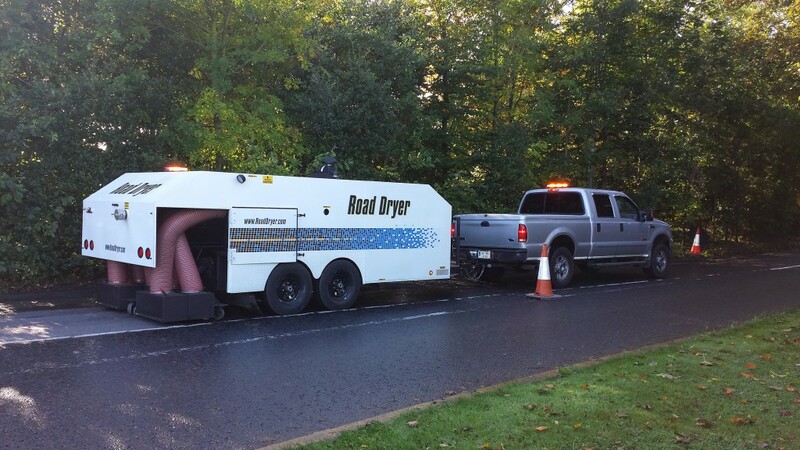 The Road Dryer eliminates all of these issues, as it swiftly and safely dries the pavement. The RD-1200XT preconditions the incoming air to remove moisture prior to heating and directing the heated air to the road, allowing faster drying time. The unit will not harm asphalt, as the flow of drying air does not exceed 300° F.
Weather is not the only cause of wet pavement. Milling processes also use water to cool grinder teeth, leaving the road surface wet and unsuitable for paving until dry. The Road Dryer can follow behind a milling machine and immediately dry the pavement for resurfacing. Because the pavement is typically ready for paving or surfacing within an hour, it allows for increased throughput by several road miles per shift. For striping operations, hydro-blasting leaves the road surface wet, and it must be dried before new paint may be sprayed. With a Road Dryer RD-1200 following the hydro-blaster to dry the surface, a paint sprayer may be run immediately behind the Road Dryer unit, to paint or repaint lines.